I was going to illustrate this review with a picture from the book, but these prove to… raise questions, far more than the book itself. More on that later. So here’s old Rudyard. I doubt that Kim is much read these days on this side of the Atlantic, so let’s go over the basics. Kim is a European, but raised as a wild child on the streets of Lahore. (He is an orphan, and a native woman takes care of him; she is forgotten halfway through the first chapter.) One day he meets a lama from Tibet, an ancient holy man who is seeking a river blessed by the Buddha. Kim has a bottomless curiosity and he has never met someone like the lama, so he decides to help the unworldly old lama get to Benares. Kim also has a quest– his father told him that he would see a sign, a red bull on a green field, and have a great destiny. So in form the book is a double quest with unlikely companions– like Huckleberry Finn and Jim, or Don Quixote and Sancho Panza. But Kim also has a friend named Mahbub Ali, who takes the opportunity to send Kim with an important letter. This introduces what will become the main thread of the plot: a spy story. Kim, with his ability to effortlessly pass for Hindu, Muslim, or European, would make a perfect spy, and he thrills to the idea. He would love to join the Great Game, the rivalry between Russia and Britain. Does this sound like a weird collection of themes? Because it definitely is. There’s a spy novel here, mixed up with a travelogue across northwestern India, mixed up with the friendship of Kim and the lama. That it works at all is a testimony to Kipling’s skill as a portraitist. Kim is fun, chiefly because he’s having so much fun– he is enchanted by almost everything he sees, except for the British-run school he’s forced to attend for a few years. 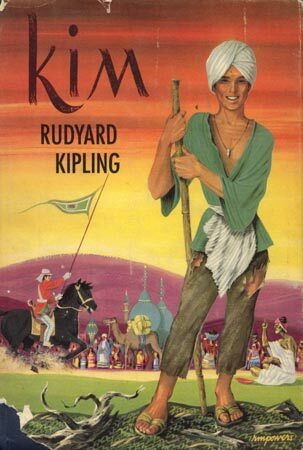 Kipling’s (and Kim’s) deep interest in everything Indian is infectious, and he has the remarkable ability to make characters who are admirable, clever, and at the same time lightly comic. By cinematic or video game standards the spy story is small stuff. Nothing really threatens the British Raj here; if these spies fail their jobs will be taken up by someone else. Which is itself a lesson for storytellers: things can be momentous without being earth-shattering or even particularly violent. The villains, such as they are, are not introduced until page 222; they both survive the book, though not without a loss of dignity. The lama’s story is occasionally pushed off to the side, and it may seem like a strange digression. But it serves to deepen the story quite a bit. Though he is often depicted as naïve or even mad, the lama is also an invaluable friend to Kim. Neither his religion nor his quest are belittled. As such his invocations of the Wheel of Life and the life of merit serve as a constant rebuke to Kim’s much more worldly ambitions. It seems clear that Kim will follow those ambitions anyway (he isn’t going to become a Buddhist monk), but it’s a nice counterpoint to have someone who thinks the Great Game is complete foolishness. You may be wondering, isn’t Kipling an awful racist? Not really. Some of the few people Kipling criticizes are those who look down on the Indians. Whether he looks on Indians accurately I can’t say, but he had a journalist’s eye for details and personalities, and if there are comic notes to some of the Indians, that’s true, or even more true, of the Europeans. And the most heroic Europeans are those who are most appreciative of Indians and Indian culture– such as the museum curator in the first chapter, based on his own father. Even in playing the Great Game itself, most of Kim’s mentors and fellow spies are themselves Indians. What he was, of course, was an imperialist. George Orwell’s essay on him is well worth reading; Orwell has a knack for clearly explaining a writer’s political problems while also freely admiring his good points. In Kim the imperialism is chiefly there through omission. The gulf between the Brits and the Indians is clearly depicted, but it’s treated as a fact of nature. One of the Indian spies, known as Hurree Babu, even complains to the foreign spies about having an European education without an European salary… a perfectly valid complaint, and yet it’s simply a trick to deceive the foreigners. Kipling simply doesn’t present a situation where Indians and British interests conflict, does not present anyone who questions British rule. There is a reference to the 1857 rebellion, but told from the point of view of a loyalist soldier… not a viewpoint a modern Indian would appreciate, but it’s certainly a historical fact that the British put down the revolt with Indian troops. At least two movies of Kim have been made, with traditional Hollywood yellowface: in one, the Tibetan monk is played by Peter O’Toole. The pictures are horrendous: O’Toole looks like Bill in Kill Bill with an obvious skullcap, and is about the least Tibetan thing in the world. I can’t resist pointing out this book cover, too. First, what the heck is Kim wearing? That is like the worst depiction of Indian clothing ever… plus how did the background somehow become the Arabian Nights? Fortunately these issues don’t arise if you just read. But you know, it all works on its own level. Kim’s identity could be turned into a dissertation, but in narrative terms he’s that most useful construct, a young man who has no real restrictions, like Tintin. If he wants to join a lama on a sacred quest, or deliver secret messages for spies, he just does, dammit. And it’s hard not to feel after reading it that you now know how best to do some begging or horse trading or school-escaping in 1880s India.